According to the GCR’s latest analysis of TOP 10 Dental Clinics 2018 in India, FMS Dental Hospitals ranks as the leading clinic in India, when it comes to overall international clinic reputation. A total of 2457 dental clinics were included in the study. The average GCR dental clinic quality score was 2.3, demonstrating the huge range of rising healthcare standards available in the country. The GCR – Global Clinic Rating, the leading provider of healthcare clinic ratings worldwide, aggregated and analyzed dental clinics throughout India in 2018 including dental clinics in Hyderabad, Mumbai, Bangalore, Chandigarh, New Delhi, Ahmedabad and others. FMS Dental Hospitals ranked #1 with a GCR Score of 4.88, and ranks #2 from 126,020 dental clinics monitored worldwide, followed by Sparks Dental Centre (4.41) and the Thaper Dental clinic (4.30). See the rest of the Top 10 dental clinics in India. It’s important to point out that the GCR Scores may change daily, depending on what has been recently changed within clinics’ expertise, facilities, services and patient feedback. Every little change in clinic’s profile can affect the overall GCR Score of that particular clinic. India offers some of the best medical treatment in the world. Its private hospitals have an excellent reputation and India’s healthcare sector has sustained an enormous boom in recent years. The country is now a global health destination, with medical tourism growing by 30 per cent each year. Despite any prejudices about healthcare in developing countries, rest assured that the private hospitals in India are at the forefront of medical technology and equipped with modern state-of-the-art technology and highly skilled medical personnel. Indian doctors are considered to be among the best in the world and their high level of surgical expertise evolves from many years of training. According to TreatmentAbroad.com, surgical patients are screened for HIV and Hbs Ag antibodies to prevent transmission of communicable diseases and the incidence of MRSA is minimal. It is normal for the operation theatres to have laminar air flow installed and gaining ISO9001 standardization (a voluntary standardization run by a nongovernmental body where hospitals must pass rigorous tests to be certified) is becoming increasingly popular in clinics and hospitals. The GCR clinic star symbol represents that the clinic has been officially verified as meeting or being above international medical clinic standards and uses the data provided by the GCR to constantly improve the clinic for their patients. 4 clinics in India have achieved the GCR international accredited clinic status. 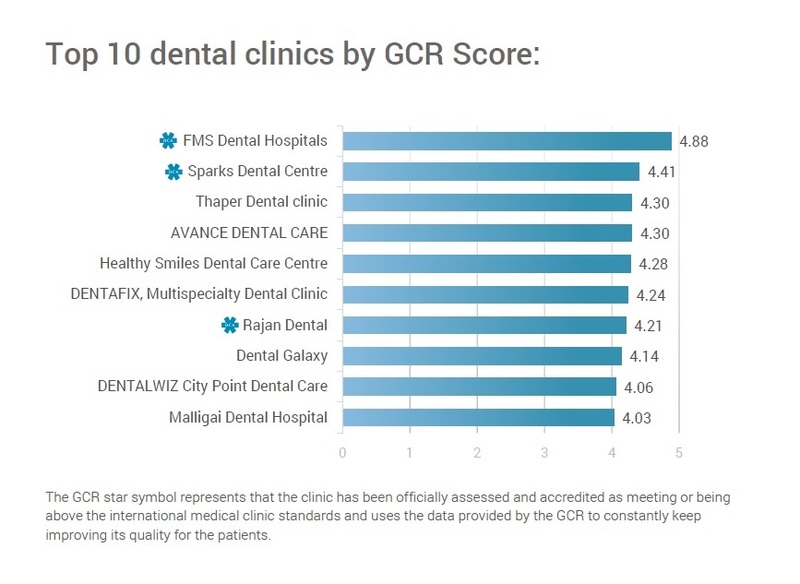 Download the GCR’s full TOP 10 Dental Clinics Report for INDIA to discover the names of the other dental clinics that made it to the Top 10 dental clinic list in India and to find some brief statistics of these clinics.